John Joseph SHAFER was born 22 April 1810 in New York at a location believed to be near Albany. John was first married at about age 19 years, in New York state, unfortunately the name of his wife has not been either located or preserved. This union produced two daughters: Hanna Maria, born in 1829 in New York and Harriet B., born before 1837. 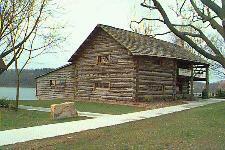 It is believed that John and his first wife separated in Pennsylvania before 1837. Still in Pennsylvania, John married his second wife, our ancestor, Lydia A. Dodge. Lydia was born 2 May 1813, in New York state. John and Lydia remained together for the rest of their lives. Little is known of John’s early years; children were born to him and his first wife in New York state; it is said that he had worked on the Erie Canal, which opened in 1825. Information gathered from the Lawrence Township, Van Buren County, Michigan census of 1860 showed the family had moved to Carlisle Township, Lorain, Ohio around 1836-37, where their eldest son, ♥ Martin Jackson was born 16 October 1837. Lorain is located twenty eight miles west of downtown Cleveland, Ohio, on the coast of Lake Erie. Birth records show that the family moved to Ingham County, Michigan between March 1849 and February 1851 where the last of their children were born. In 1855, the family moved to Lawrence Township in Van Buren County, Michigan. John Shafer was one of the first white men to settle in that area, which was west of a lake on the township line next to Hartford Township. The lake was named, Shafer Lake after settler John Shafer. In the year 2011, the lake still bears the Shafer family name. John acquired a considerable tract of land in Lawrence and Hartford Townships. A piece of this land was donated for a school on Lawrence Township. The Shafer School, as it came to be called, was built on the property, located on the northeast corner of the crossroad that runs to the south of Shafer Lake. The building was “The Shafer School, Hartford andLawrenceTownship’s Fractional District No. 7”. “John Joseph Shafer the one this history is about, the writer well remembers the tellings of his first settling in Lawrence Township, Michigan. “Crops raised were beans, corn, hops, oats and wheat. The last two were harvested with cradle scythe, tied with a few stalks of grain into bundles, which were stored in the barn to be threshed; this usually done in cold weather. In 1860 or shortly thereafter, John a Lydia’s youngest daughter, several year old, Lodema, died of TB. It was thought at the time that the disease gained access to Lodema’s system after she had breathed hot steam (!) through he mouth and into her lungs from a boiling tea kettle when she was a small child. 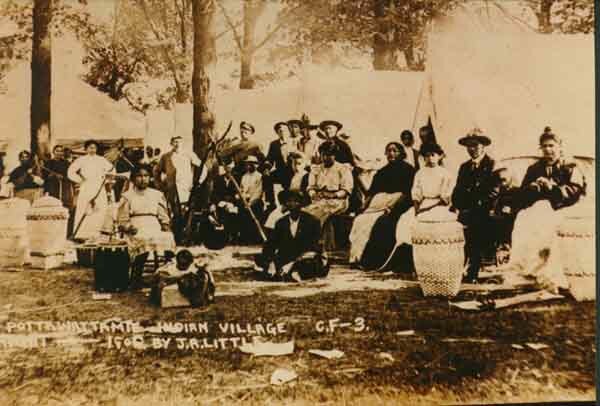 “…some of the Pottawattamie Indi ans (the tribe use to live around Lake Michigan’s southern shores) use to come in summer months and put up their teepees along the roadside and then work for the farmers. As late as 1906 the writer remembers them along the road about a mile and a half south of the old Shafer homestead, and not far from where the writer lived they picked huckleberries in the swamps for the owners. church and burial ground they used,. Located in a thicket on the south bank of Rush Lake, north west of Hartford, Michigan about four miles. End of Howard Leroy Shafer’s account. In the years after 1860, the Shafer family cabin burned down. John Sr. and his youngest son John Wyman Shafer Jr., who’d became a carpenter, built a new house just north of the Shafer School. Some of John Joseph’s children and many of his descendants, including Howard Leroy Shafer, attended the Shafer School. The school house burned down twice and thereafter was not rebuilt. The old home place and school ground was in 1967, still owned by a Shafer descendant. John’s wife, Lydia, died 26 April 1882 in Lawrence Township at age 68 years 11 months and was buried in the New Lawrence Hill Cemetery. him-going off the road and throwing him against a tree. The injury received by 84 year old John J. Shafer caused his death shortly thereafter on 5 February 1895. John was buried alongside his wife in the New Lawrence Hill Cemetery. Some time before his death, John deeded parcels of about 28 acres to each of his heirs. On 20 February 1895, John W. Shafer Jr. petitioned for an administrator to divide his father’s personal property which had an estimated value of about $900. Elijah M. Shafer, another of John‘s sons became administrator and listed the heirs to receive their share. The Will was not probated. The Shafer family descended through Martin Jackson Shafer, to his son Charles Elmer Shafer, to his son Pearl Elmer Shafer, to daughter Hazel May (Shafer) to myself, Larry and daughter Jane Elizabeth. John Joseph Shafer: A Life story has been, taken from the 93 page family genealogy book, Descendants of John Shafer 1810-1967 by Howard Leroy Shafer, who was born in 1898. I stand at the bathroom sink stirring my shaving brush in a white porcelain mug on which is painted the picture of a ‘lion amongst canes’. After carefully sloshing warm water onto my face, cheeks and below my chin, I lather the whiskered portion of my oval-rectangular shaped face. For me at fifty-two years of age, shaving is not an unpleasant task. Beginning just below my high cheek bones, I stroke down to the jaw. After several careful strokes with the razor I’m to my chin, where care must be taken as I have a fairly deep cleft. Then on to shave beneath my straight and slightly up tilted nose. My lips are a slight light red, their part at my mouth is straight. The sides of my mouth seem to dart slightly downward, so as to give the appearance of seriousness. My top lip is somewhat heart-shaped. The bottom lip, a bit fuller than the top, ever so slightly resembles a person who’s pouting. The coal-black pupils of my eyes are surrounded by blue iris’ which contain gray and yellow flecks. A thin layer of fat, under the skin, in the orbit above my eyes cause the skin to sag at a slight angle, just covering my open eyelids. The effect is to make it appear that I have a concentrated piercing gaze. Two slight furrows run across the center half of my forehead, beneath these several more angle down to intersect my brows. My eye brows gently curve above each eye and are composed of dark brown hair in low density, so as to make them appear light brown. After washing my clean-shaven face of remaining suds and drying on a fresh towel, I pick up a flexible black plastic comb. Parting my shortish brown hair on the left, I comb the mass up across the top to fall nearly to my right ear. After several more passes with the comb across the top, then front to rear above each ear, then finally forming a swept back wave at the top front and my hair is groomed. Here and there amongst the swath of my brown hair lie almost unnoticed strands of blonde and golden red, amongst my short sideburns are there are now growing a few strands of gray. Walking into the bedroom, I select from the closet a pair of comfortable wide wale brown corduroy trousers, a cordovan leather belt and a plain, light maize colored long-sleeved, cotton shirt with button-down collar. These clothes are laid out on a dark, rich colored quilted bed spread which covers our brass bed during the winter months. From my antique oak dresser, I remove a pair of neatly rolled boxer shorts, a folded and slightly faded wine colored undershirt and a pair of folded brown, green and burgundy, wool argyle stockings. The underwear I wore from late the previous afternoon, until my wash cloth bath, only moments ago, are unceremoniously thrown into the clothes hamper. Stooping to pull on my fresh shorts, I note with some amusement the apparently double jointed three inner toes on each of my feet. Between my wide large toes and the small, little toes are three long toes which I can simply cause to bend at their joints. When standing, I can keep the first phalange horizontal, bend the second down vertically and the third or outer length points out horizontally again. My ankle is bony. My calf’s and thighs are proportional and muscular, without a trace of fat. There is little fat anywhere on my body, except for a very small band across my stomach. Pulling the wine colored undershirt over my head and slipping my well-formed and somewhat muscular arms through its short sleeves, I note my upper arms have very a very sparse covering of hair. My lower arms have sparse dark brown hair on their back, but essentially none on the paler inner surfaces. I have considerably denser hair on my chest and abdomen than on my arms or legs. I now pull on my pants and shirt, button the shirt, except for the collar button, tuck the shirt tails into my trousers. The belt is fastened and fly zipped up. Although I weigh 169 pounds, stand 5’10” tall and wear clothing labeled “Large”, I’m relatively small boned. Sitting on the bed, I slip on and tie my size 10D, brown leather, Wing Tip Oxford shoes. My hands which are normal sized for my wrists, have large palms; probably inherited from my maternal grandfather, Pearl Shafer. My wrists though small boned, combine with my hand and finger muscles to give me an unusually powerful strong grip for my size. Now dressed, I stand looking into our full length bedroom mirror. I have a broad chest which makes my body appear a bit larger than one might guess if I was viewed from the side. In a crowd I am taller than the average by a couple of inches. I’m lightly complexioned, have a relatively long, and thin neck which is flesh-colored. My somewhat oval-rectangular face with its high cheek bones and rather thin nose make me handsome in a masculine way. At the same time, the darts at each corner of my lips, the furrows above my brow and my piercing gaze lend a sense of frowning seriousness to my continence. I appear to be between the ages of perhaps 42 to 46 years, certainly not my chronological age of 52. Turning my head slightly to the right and looking across the top of my dresser, I look amongst many small, old, nicely framed, family photographs. My sight comes to rest on a double frame which contains picture’s of my parents, pictures taken a half century earlier. Reflecting on the images of their frozen youthfulness, I become lost in thoughts about life. A light trance begins to obliterates the immediacy of the moment as my mind swirls back across time, tunneling through the decades of my life, and before, where kaleidoscopic particles coalesce to form an image of the world that existed before my birth. Come, join me and we’ll walk hand in hand across these pages of time, in this, my life story. In the Fall of 1929, Yale University economist Irving Fisher, one of the most highly regarded experts in the nation, stated confidently: “The nation is marching along a permanently high plateau of prosperity.” Five days later, the bottom dropped out of the stock market, ushering in the Great Depression, the worst economic downturn in America’s history. On October 29, 1929 orders to sell stocks at any price overwhelmed orders to purchase stocks. Millions of dollars suddenly vanished from the American economy in a matter of hours. Large corporations, small family businesses, and individual investors alike all found themselves in the same position—teetering on the edge of bankruptcy or already there. American citizens suffered through what came to be known as the Great Depression. Not only was the economy sour with factory closings, and high unemployment rates, but there were ‘runs’ on banks and depressed commodity prices. In the American Midwest, a severe drought brought on the ‘Dust Bowl’ of blowing sands and parched land, destroying livelihoods, forcing migration. The combined effects of the depression, banking financial crisis and the Dust Bowl were felt in homes all across the United States. It is during this time, and within these events in the background of daily life, that we begin this story. My paternal grandparents, grandfather Glen K. Pierce, was teaching Engineering at Morton High School in Cicero, Illinois. The school system was having a difficult time meeting their budget, so part of the Illinois School System teacher’s pay was in ‘script’, not cash; however, script was not accepted as cash in all commercial transactions. Glen was forced to take a part-time job driving a taxi in order to support the family, a family which consisted of wife Elsie (Grubb), and three sons: William Glen, Jack Pershing and my youthful father, Robert Francis Pierce. As the 1930s wore on, the family became increasingly concerned with their financial security. Wanting to provide a safety cushion for themselves, Glen and Elsie bought a ‘retirement farm’ located between Benton Harbor and Coloma, Michigan. During summer vacation, the family lived at, and worked on the farm. As they worked, they remodeled the barn and house, installed water and indoor plumbing, and planted about fifteen acres to orchard. Their youngest son, Robert, an older teenager, having just graduated from high school, helped on the farm; eldest son, William, was living in Chicago, attending college; and brother, Jack, had left home and was living with relatives in Iowa. Meanwhile in Germany: Following a period of hyper inflation, Nazi political leader, Adolph Hitler, was becoming a powerful national figure. Around the world, the island nation of Japan had undergone rapid industrial modernization, her political thinking became militaristic. Japan looked over the ocean horizon and began planning for expansion. In early September 1939, Germany attacked neighboring Poland. Hopes for peace in Europe rapidly collapsed as the world teetered on the brink of World War II. In an attempt to check Japanese plans for expansion in the Pacific Ocean, the United States placed an embargo on American oil and scrap metal being sold to Japan. One weekend evening, while the family was at the farm, my father, Robert (Bob) attended a dance at the very popular Crystal Palace Ballroom on Paw Paw Lake, near Coloma. 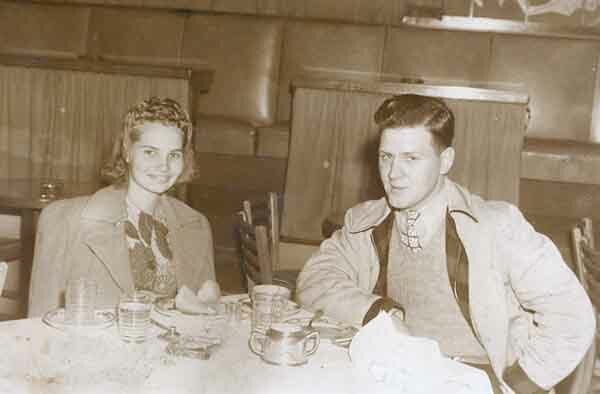 That same evening, Hazel May Shafer, nicknamed “Haz”, was just beginning to socialize after the loss of her boyfriend, Larry, who was killed in a train-automobile collision. Hazel lived with her parents and brothers on a farm near Hartford, about twelve miles east of Coloma. Bob and Hazel met at the dance and made an immediate impression on one another. A courtship followed which resulted in their marriage a year later. During the winter of 1940-41, Bob finished his second year of college. Bob was only twenty years old at the time of their marriage, so, in order to get married without his parents consent, he signed the wedding license stating that he was twenty-one years old, which he wouldn’t actually be for another four months. After the marriage ceremony, the newlyweds went back to the family’s ‘retirement farm’ to live. Needless to say, Bob’s parents, Glen and Elsie were surprised when they came home a few days later to find their son had been secretly married. Apparently they weren’t too offended, because Bob and Hazel continued to live on the farm for a matter time, before Bob got a job back near the family home in Chicago, Illinois. President Franklin D. Roosevelt froze all Japanese assets in the United States, the Japanese were furious. Conditions between the two countries continued to deteriorate. Meanwhile, U.S. Military Intelligence broke an important Japanese code and began secretly monitoring her military and diplomatic communications. By December it appeared that Japan was about to take military action, but where? Meanwhile, on a little, “backwater” Pacific island known as Hawaii: the U.S. Army, responsible for defending the Naval Base at Pearl Harbor, became concerned over possible sabotage by some of the Japanese descendants who lived on the island. The Army was put on the mildest of its three alert levels. Airplanes were parked in bunches to make it easier to guard them, anti-aircraft guns were retained in their parks, ammunition kept in magazines. Since this was a weekend and a time of rest, the mobile radar crews were manned only between the hours of 4 A.M. to 7 A.M. The first wave of Imperial Japanese warplanes swept down on the U.S. Fleet moored at Pearl Harbor. Servicemen aboard their ships were stunned: A Commander on the bridge of the U.S.S. Ramapo banged away at the attacking planes with a pistol, tears laced his face. A “boson’s mate” threw wrenches at the low flying aircraft. From the ships magazine came a call asking what he needed. “Powder !”, he yelled, “I can’t keep throwing things at them.” A sergeant in the 27th Infantry at Pearl Harbor refused to issue ammunition. He pointed to a sign that said, “No Ammunition Without Captains Orders”. The gunners on the U.S.S. Argonne shot down their own antenna. 110 minutes later, it was over. We were at war. Eight big U.S. battleships and three light cruisers were sunk or seriously damaged, 188 U.S. aircraft destroyed and 2400 American servicemen were killed. In this short time the Japanese inflicted greater losses on our Navy than we suffered in World War I. During the engagement, Japan lost twenty-nine aircraft, five midget submarines and one fleet submarine; their attacking naval fleet wasn’t even detected. Following the attack on Pearl Harbor, President Franklin Roosevelt had a brief telephone conversation with England’s Prime Minister, Sir Winston Churchill. After the attack on Pearl Harbor, the cloud of war took on a global character and became, World War II. The Japanese Empire rapidly expanded its control in Southeast Asia, while Nazi Germany sent its army across Europe. Although Germany had wished to keep America isolationist, her Japanese ally had overlooked the size and determination of the Americans. Immediately following the infamous “sneak attack” on Pearl Harbor, the industrial giant America, awoke. Factories and workers, idle from the Great Depression gained full-time employment. Between 1940 and 1944, as the American war machine grew, unemployment in the U.S. dropped from over eight million to around six hundred thousand, where the latter were simply persons between jobs. The growing needs of our beleaguered Allies, our soldiers and the civilian population at home created a stressful burden on the nation’s production facilities. Food rationing began, starting first with sugar, then spreading rapidly to include all canned goods, meats, shoes, coal, fuel oil and gasoline. Other items, such as bobby pins, nylon hosiery, alarm clocks and razor blades, though not rationed were in short supply. Rationing was officially put into effect when the government issued Ration Books, small paper covered booklets each containing several pages of small coupons. When purchasing rationed products, the housewife paid with both cash and coupons. Rationed items had a double value, they cost in terms of money and coupons. Regardless of ones wealth (in theory) each person was entitled to only one book for each defined ration period. Below are listed some product values in terms of their “coupon cost”. Red and Blue Ration Stamp values: Red and Blue Ration 1 point each. Besides the rationing, women saved and turned in empty tin cans for scrap, while bacon drippings were used in explosives production. No one went hungry because of either rationing or the shortages, both were merely considered annoying. Glenn and Elsie continued to teach during the school year and work on their rural Coloma, Michigan fruit farm during the summer. 23 July 1942: Gasoline rationing begins in the USA.